Digital solutions to overcome institutional challenges in recognising students’ wider achievements to increase motivation, engagement and employability. Building on the previous P2A Employability Skills Match project discussed in blogs below, Jisc is now dipping its toe in the digital credentials arena by exploring its own badge platform. We plan to start designing and issuing badges for delegates who take part in Jisc training, such as the Digital Capability project. As Jisc develops its own digital credential offering, we will also work with a community of University and College staff that are keen to explore the uses of badges and other digital credentials. This will build on the ALT survey that ‘shows that there is a lot of interest in the use of Open Badges, but the majority of institutions are at an exploratory stage’. We would like to understand what technical support the sector needs in order to further explore the potential of digital credentials as the survey suggested that ‘while the VLE was stated as the method that the majority of institutions were using to issue badges, many commented that upon investigation the solution provided by the VLE needed further development and may not be fit for purpose’. Jisc RSC Scotland began issuing OpenBadges in 2013, and badges were awarded for digital leadership, digital innovation, and to digital practitioners. Further information about these badge series can be found here. Jisc is currently refreshing the resources that they developed and further information will be available soon. Compared to paper versions, digital credentials offer new technical challenges such as security for verifying the learner and their achievements, but also opportunities with new ways for learners to choose their own pathways, stay motivated with more frequent rewards and showcase their more granular achievements to new audiences. Also more tailored matching services are being created with the more detailed achievements. Digital credentials enable organisations to assess and award credentials beyond the traditional transcript. Such credentials enable institutions and learners to differentiate themselves in an increasingly competitive world. There is further discussion about this challenge in previous P2A blogs below. Purposes of badges: Badges can be used for various purposes such as motivating the earner with more frequent rewards. Digital games recognised this benefit in enhancing the players sense of achievement and maintain their interest for longer. Players also use digital credentials to demonstrate their mastery to their peers, so digitally sharing their achievements globally is an important motivator too. Now my FITBIT award me badges for exceeding daily fitness goals! Various parts of the education sector are capitalising on the increasing use of digital credentials to engage learners that might have previously been turned off education. City and Guilds who have created Badges to go into their online CV. ‘Employers are increasingly recognizing badges as they verify the skills of a learner’. ePortfolios are important tools for learners to gather all sorts of evidence to reflect on and substantiate their skills, competencies and achievements not only for personal development but also for showcases to peers and possible employers. Jisc has been a leading proponent of these, helping to embed them within the sector. We are currently exploring whether the Higher Education Achievement Record section 6.1 (additional verifable experience) could be a digital repository to reflect a broader and more consistent view of the learner’s accomplishments and interests that the institution is able to verify, linking into the institution’s student engagement and employability strategies. Who else is developing digital credentials? DigitalMe is a not-for-profit organisation using Mozilla Open Badges to work with teachers, charities and employers to create a new digital currency that recognises all young people’s skills and talents. They support the use of the Open Badges Academy (currently Beta testing) and MakesWaves for under 16 year olds. BESTR is an Italian digital platform based on Open Badges that aims to valorise one’s own competencies and connect them with companies, Universities and training institutions. IMS and their partner institutions, including Jisc, have an evolving Competency Based Education (CBE) architecture to enhance the capabilities of the existing education enterprises designed around courses and credit hours. Posted by ruthdrysdale on January 29, 2016 in Uncategorized. The BIS Outcome Based Success Measures Consultation sets out detailed proposals for using student outcomes as a key metric for Further Education. The new experimental data set created by BIS to support this activity provides an indication of sustained student outcomes. An emphasis on destination and the data available changes the way FE is evaluated and will have significant impact on FE providers. This impact is not yet clear but providers will need to engage with the new metrics and data and use it in a range of activities such as strategic planning, monitoring, understanding local needs and reporting. Jisc is exploring the newly published data and is interested to understand what new information, insights and opportunities it offers for FE providers. We are taking an agile co-design approach and wish to engage FE providers in the exploration of this data and its potential. We will be developing experiments with the data to make it useful and usable to managers in their future work. This will include asking for feedback on concepts, insight into your concerns and good ideas and validation/challenge of our assumptions. There is place for Jisc to bring together this destination data set with other information we are working with to make it more valuable to our customers. We call the stage we are at the “alpha’. This means we will evaluate where we stand in Feb 2016 and decide if there is a place for Jisc to support the sector. Jisc use a co-design approach for all our developments and would value collaboration with managers and decision makers (deputy principles, MIS managers, vice principles, curriculum managers) in FE colleges. 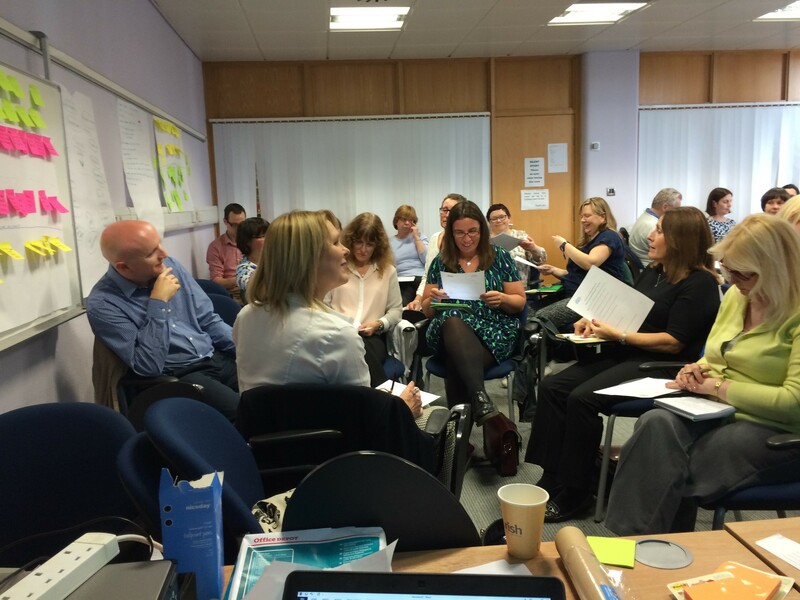 How do you feel you will be making decision about sources provided in light of the new data and evaluation framework? How might the data be used to help you meet the needs of local populations, businesses etc? 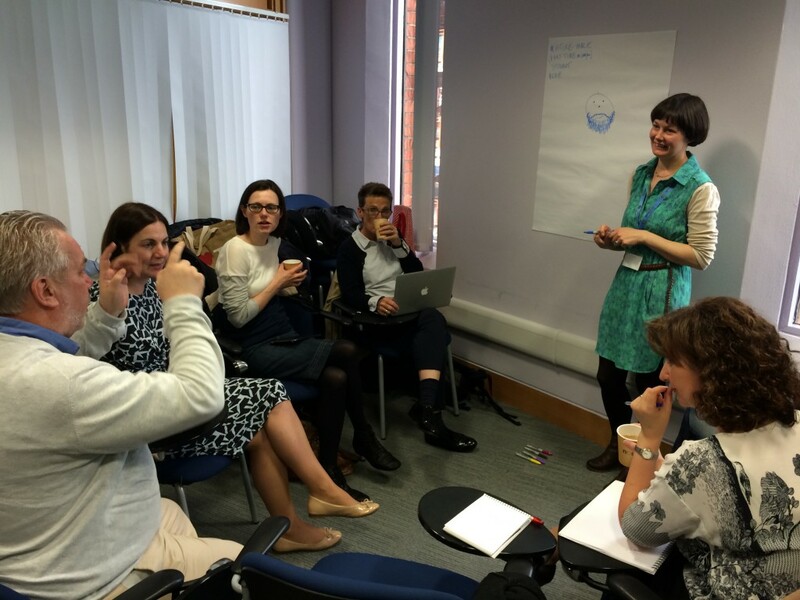 How might the data be used in monitoring quality and demand for our courses? How might the data available impact on the way you report? Are there other areas where you feel the data will be used, where you have needs or ideas? Posted by Shri Footring on November 30, 2015 in Uncategorized. As part of the Optimising the student journey project, Ruth Drysdale and I were invited to visit Queens University Belfast, to run a workshop on understanding the student experience and journey mapping with a small group of staff led by Olivia Roberts (Head of Student Services and Systems). I had previously worked with Queens, introducing them to the service design (SD) approaches which we had taken at Derby University to improve student enrolment. Queens took these ideas onboard and developed them to great success (resulting in a THELMA) so we knew that they were already au fait with the concepts behind taking a user-centred approach. Drawing on some student feedback (pain points) as well as survey and other data sent in advance, the staff were taken through a short deep dive SD process which resulted in ideas for changes to information systems (looking at how, when and who holds the data) which would impact on communications and the felt student experience. However, although we surfaced some real potential solutions, the main aim was to introduce the team to SD tools and techniques, in particular, personas, service blueprinting and journey mapping, so that they could begin to see how they could themselves map the end-to-end student journey in relation to how data is held and managed in their student records system. A not untypical soaking to the skin in Glasgow – luckily I had my suitcase with me and a complete change of clothes later I was ready to go. The next day, Ruth and I travelled up to Glasgow as, following on from a session which we had delivered at the UCISA conference in July, we had been invited to run a full day workshop on student journey mapping for a group of 24 librarians from (mainly) Scottish Universities (though there were one or two interlopers). As we were about to leave the hotel we ran into a rainstorm and I got as wet as I have been for quite a while as I had to make a mercy dash to W H Smiths to stock up on workshop materials. 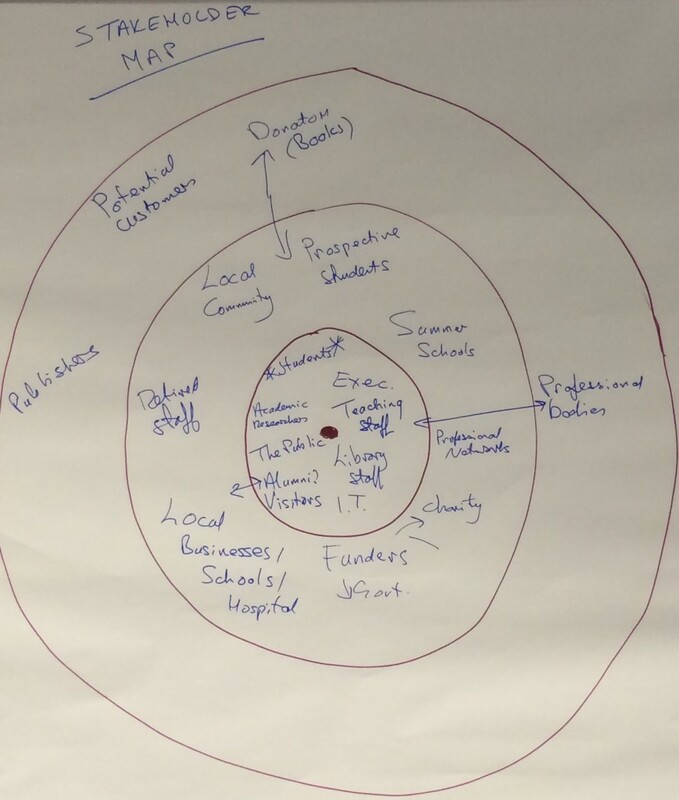 The room was a challenge – there were no tables and it got rather hot, but once the delegates were into four groups they began brainstorming who their ‘customers’ were which resulted in a rough and ready stakeholder map. 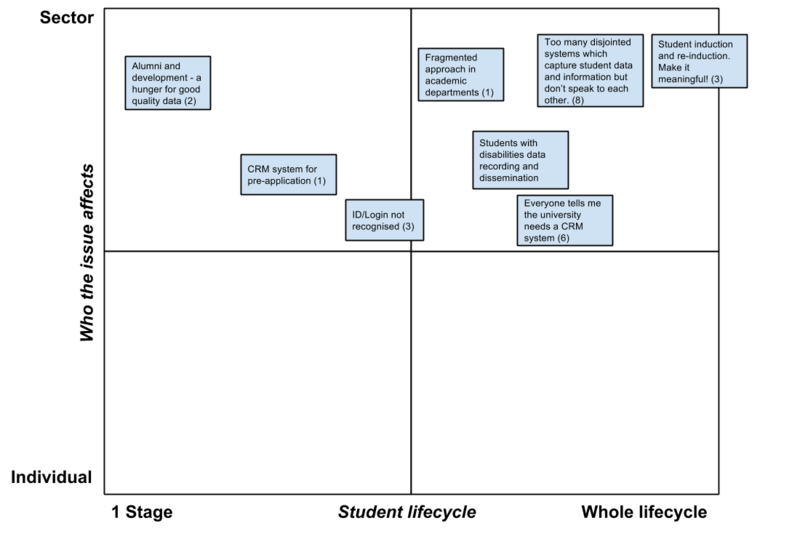 Identifying key users with a rough and ready map of stakeholders of university library services. We moved onto developing personas and an introduction to service blueprinting, taking our student personas on a trip to buy a coffee to get the delegates used to thinking through the ‘journey’ step by step in a chronological fashion with all the component parts, front stage and back stage, mapped out in detail. Personas help build empathy by getting ‘under the skin’ of the service users and seeing the service through their eyes. This led them to map out what that service journey would look like from the end-user perspective, picking out ‘fail’ and ‘wait’ points, where resources could be targeted to best effect to make service improvements. The delegates really got into mapping the journey in detail in the service blueprint. And so the day ended in sunshine and we spilled out onto the streets of Glasgow, ready for our tea and cake. Posted by Shri Footring on November 5, 2015 in Optimising the student journey. Over the last few months, Ruth Drysdale (Jisc); Shri Footring (Jisc); Julian Bream (FE Consultant) and myself, newly released after 30 years in the HE sector into the world of consultancy, have been travelling around the four nations talking to staff in colleges and universities. We also went straight to the horse’s mouth and ran some student focus groups (although they tend to go underground or back to Hobbiton in the summer months). The focus of this Jisc project is not the transformational aspects of the student experience, andragogy and pedagogy, but where the student is the end-user of a service, and there are lots of examples of this transactional experience across the student journey which could be improved by looking at that experience by stepping into the students’ shoes and looking at the world through their eyes. Our brief was a simple one: find where the student ‘pain points’ are and discover what Jisc could do to help co-design technical solutions. 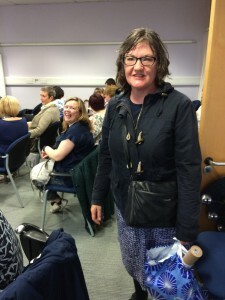 And so we left the Shire (in my case Derbyshire) and our journey began…. everyone wants to improve the student experience in their own organisation (who wouldn’t?). However, how they are all going about it can be as varied as the number of people you talk to. Some are keen to take a Lean approach; some are looking at data; some are into process mapping; some want to map the student journey but do not know where to start ,and some just looked at us blankly when we talked about co-design and understanding the end-user experience. When an organisation like Jisc makes contact with an institution on a project like this, they are most likely to be put in touch with the Business Analysts who often sit in IT departments. No problem there you may say, but what we have seen is that there is real value where an FE or HE organisation can make the connection across all the constituent departments which impact on the student experience. From what we have seen, there is a lot of silo-working going on and a lot of effort spent on reviewing processes solely from the business perspective. None of the staff we talked to could say that they joined the dots across all the feedback and data they get on the student experience so that they could turn it into insightful and meaningful action which would improve their student journey. There is a wealth of engagement and other data now available through Learning Analytics which would enable institutions to have a better understanding of the student journey and how to support not just those ‘at risk’ but all students. There are several common ‘pain points’ which impact on the student journey, but not all are immediately obvious culprits, as they are internal. For example, some of the problems around programme organisation and management (a repeat offender if you look at anyone’s NSS) may look as if they are management issues, and they often are, but the impact will be on the felt student experience. Finding out what students really want and need, in a timely fashion, and not just what you want to tell them, is key. Of course, there will be lots of information which students do not know they need (how to enrol, etc) but if they are not in a position to listen to you (right channel, right time) you might as well not bother. The number of queries which support and other services have to deal with because students are just catching up with key information late in the day (if they are lucky) is staggering. (John Seddon calls this ‘failure demand’). Which brings us to the student ‘transition’ – what happens to a student in those first few weeks can colour their experience for the rest of the time studying at an institution. If they can feel ‘at home’ and engaged with this brave new world early on, they have a better chance of finishing their course and achieving their potential. At this point, this is not about knowing the academic regulations backwards, what the Careers Centre can do for you (or, dare I say it, even how to use the library) but knowing your way around the University or College and the town, where to shop, and someone to go to if you get stuck (or if there are Orcs around). Self-management at this time is crucial and students have spoken to us about feeling overwhelmed by all the information coming their way, whilst they are trying to adjust to a whole new environment. So, what’s to be done? As we have seen from the first bullet point above, the ‘student experience’ is still on everyone’s agenda. However, most institutions do not know where to start (there are exceptions – MMU for example, which is mid-way through a major change project ‘wrapping the institution round the learner’). From what we have seen, many institutions lack the wherewithal, the right focus or just fail to see the need to really put the student at the heart of what they do, but how much longer can the sector continue with such a reactionary stance? Where is Gandalf when you need him to conjure the fireworks? Still stuck in the Ivory Tower of Orthanc, I’m guessing. Posted by Shri Footring on October 23, 2015 in Optimising the student journey. Why are we focussing on soft skills for the Employability Skills match service (ESMS) we are designing and developing here at Jisc in the Prospect to Alumnus co-design challenge? Scarcely a day goes past without an article or event which draws attention to the disconnect between the worlds of education and employment, and highlights soft skills as at the core of this. The most common observation in this debate is that employers of all types are struggling to get recognition, in the world of education, of the soft skills, qualities and attitudes that are fundamental for an effective employee/ organisation member. Typically these vital qualities are empathy, resilience, versatility, cross-cultural awareness, initiative and the like. A recent study concluded that soft skills are worth £88 billion to the UK economy. The UKCES has concluded in a report that these qualities will only become more essential in the future: “skills and attributes that will be at a premium in future, including resilience, adaptability, cognitive skills (such as problem solving), and the core business skills for project based employment”. However, for those, perhaps in academia or in other less economically-driven fields, these qualities have an equal significance. In short, the happy accident is that, as the weight of evidence shows, the skills valued most by employers are the skills that are most valuable in society. These are in fact life skills. And we are all lifelong learners. Personal develpment is not an academic pursuit but a responsibility we each have to ourselves, and to society in general. providing a means by which learners’ non-academic achievements such as p/t jobs, sport and musical activities, volunteering, work with NGOs etc can be recognised and valued. For it is actually often these extra-curricular activities that are most formative in developing the core life skills and soft skills so valued by employers and so valuable for the individual. 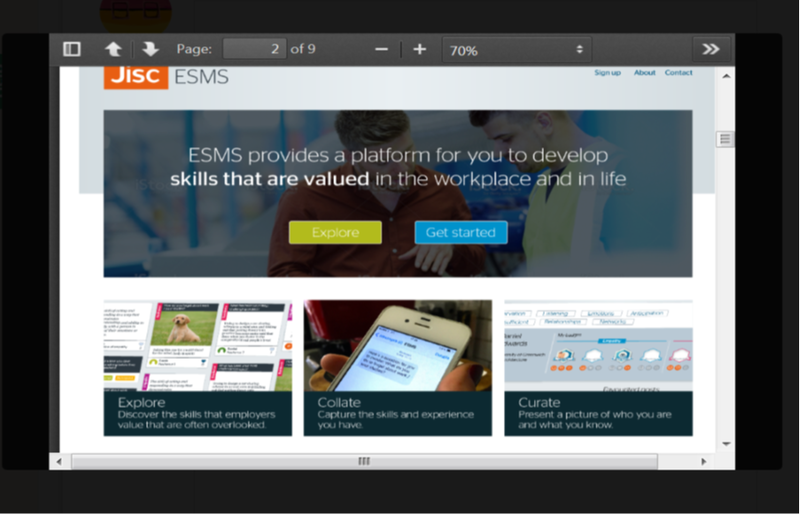 We have developed a very simple three-category skills framework that underpins our ESMS service. Think of the three categories as the layers of an onion, with Qualities at the core. These qualities have been expertly broken down by Simon Grant into their component behaviours that learners can demonstrate and self-appraise, which will provide the learner pathways in our ESMS service. Open badges are a valuable tool in recognsing these non-academic qualities, so our service will be based on open badges, defined by employer consortia. Courtesy of CINECA’s blog for their .Bestr service, which shares features and concepts with ours, here is a philosophical take on open badges from a leading expert in learning technologies, Serge Ravet. Eportfolios are also an important tool in the world of learner personal development, and Jisc has been a leading proponent of these, helping to embed them within the sector. Our skills- match service will complement ePortfolios and also the Higher Education Achievement Record, and these components will be inter-linked in future development phases. In fact, Jisc is very busy in the economically-critical areas of employability and digital skills at the moment; our Digital Capability co-design challenge has developed a framework of digital skills, including Digital Innovation/entrepreneurship and Digital Learning, with which our employability skills-match service strongly resonates. The reality of the wider context of lifelong learning and life skills rather than just graduate employability has been demonstrated in the Technology for Employability work. We hope these combined initiatives, as we work with our partners and stakeholders, can help equip learners, HE and FE institutions and indeed ‘UK Plc’ for the knowledge economy and learning society of the future. Posted by Simon Whittemore on June 19, 2015 in Uncategorized. Project three of the Jisc Prospect to alumnus is all about employability. Working with a range of partners and stakeholders, we are designing exciting and innovative new services which will empower students’ employability, meet employers’ needs and enable institutions to track and demonstrate the employability of their students. Prospect to Alumnus (P2A) employability work is focussed on delivering a dynamic online employability skills-match service, an employability data service in the medium term and, in the longer term, a learner cradle to grave data service. This blog post deals mainly with the first of these three services. The work complements Jisc’s Technology for Employability project which is investigating and uncovering themes for development such as the need for better partnership working with employers (Jisc’s Business and Community Engagement resources are also relevant in this regard). Our vision for P2A has been shaped by three contextual factors. These are: the current pressures on universities, colleges, learners and graduates around employability (with expectations heightened in the tuition fees environment); recent findings from the CBI and others such as McKinsey that make abundantly clear the Europe-wide education to employment gap; and the national economic and social imperative for sustainable improvement in employment prospects. 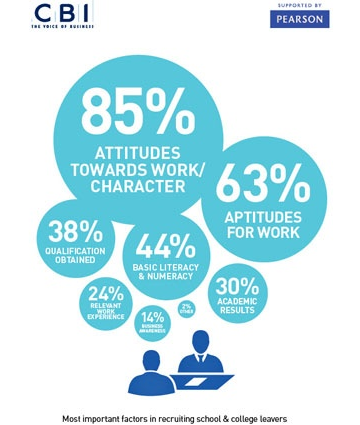 A 2014 CBI Pearson survey found that employers value attitudes and aptitudes above all in school and college leavers. Indeed attitudes, (as in character) were valued the highest, with qualifications considered half as important. Attitudes and aptitudes also emerged as vital when employers were asked about the most important factors considered when recruiting graduates. In the same CBI report, a quarter of employers surveyed stated that they were dissatisfied with graduates’ problem-solving skills and the same proportion dissatisfied with their communication skills. More than half of employers were dissatisfied with graduates’ business and customer awareness and a similar proportion with their foreign language skills. There were also notable deficits of satisfaction in graduates’ relevant work experience, intercultural awareness and self-management/resilience. Most large graduate recruiters prefer to invest up to a year of training in recruits to make them job-ready. In their Report ‘Education to employment: Getting Europe’s youth into work’ (P.45 of Report, Exhibit 22) McKinsey found that, across Europe, the deficit between skills needed and competencies apparent in entry-level employees was by and large greater for soft skills than for hard skills. In a recent NCUB Fuse event I attended, two renowned entrepreneurs leading creative, media and digital SMEs highlighted what they value in graduates. Simon Morris of Bareface Media stressed the need for ‘graduates to be able to think/work across subjects/boundaries’, and for Naveed Parvez of Andiamo, the single most important quality for people in building and developing a business is empathy. Naveed called for ‘a greater mixing of disciplines within universities’, while David Dunn, Chief Executive of Sunderland Software City said we need ‘T-shaped people who have a vertical discipline and lateral appreciation of what others do and what motivates them’. Several speakers highlighted the forgotten value of arts and humanities as making a major contribution to some of the qualities sought. 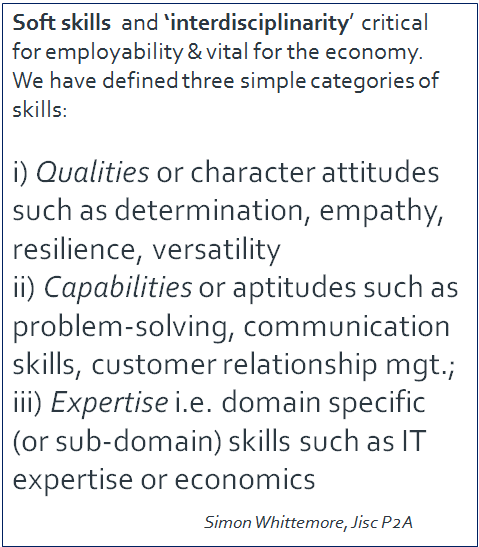 iii) domain specific (or sub-domain) skills such as IT expertise, economics, illustration/drawing etc. Level ii) and iii) skills remain important (STEM skills to name an obvious example), but it is apparent from the above that there is an acute need for the level i) qualities. Yet these are not currently reflected in any meaningful way (other than through e-Portfolios) in the education to employment system. This conclusion is somewhat counter-intuitive, given the legitimate fears many academics have about losing academic integrity and independence through stronger business influence. The skills we are talking about are life skills, so are not a threat to this, yet they are precisely what employers are crying out for. In Prospect to Alumnus, we plan to provide a digital employability skills-match service that can address this employer need, and can at the same time empower students and graduates by building their employability capital. How do we propose to do this? learners and graduates to claim, using third-party attested examples, that they have demonstrated particular soft skills and qualities in their non-formal learning and experience. Learners could also potentially self-assert that they qualify for a badge, and employers consortia could endorse this assertion. The examples cited will need to be in a consistent and very concise format, accessible to, and co-designed with employers. badges will be created and defined by employers consortia rather than individual employers. Based on this pilot service, which we plan to deliver in the autumn, we will develop a more extensive and sophisticated Employability Data Service initially for further education (in response to demand), then subsequently for higher education. There is scope to improve education to employment vocational pathways, so that these become more attractive and fruitful to students, learning from elements of the German and Austrian models. The Employability Data Service is likely to involve level ii) aptitudes and skills as defined above, and will involve institutions in the supporting and tracking the process, but we are open-minded about how it will work and its features, and welcome your comments and involvement in the process. Our modus operandi is by necessity rapid and agile. We recognise the need to be flexible, with iterative and overlapping phases of design, develop and user test, and we may need to redesign some aspects of the service. We are currently collaborating with our Italian development partners CINECA, our service design partners Livework, student representative groups and employer consortia, as well as expert consultants and key stakeholders to design this exciting digital service. Posted by Simon Whittemore on April 3, 2015 in Uncategorized. The Prospect to Alumnus projects are taking shape. Our extensive consultation, from the first co-design workshop to the regional workshops summarised in this blog, the online questionnaire, a major student consultation and numerous staff interviews, has confirmed the appetite for Jisc interventions in this area. Lifelong online student data service supporting mobility. • embedding the tools and culture to track and develop employability capabilities and data from admission to graduation and beyond. The Employability Skills Match Service will also start in March. This aims to deliver a dynamic skills matching platform for employer consortia and students/graduates using open badges, to better recognise and reward the attributes employers need in candidates, especially soft skills. We are working with colleagues in Italy at CINECA to realise this solution, as well as key sector players and employers groups in the UK. This service will be developed, with other features, into an employability data service initially focussed on further education, then extended to higher education. The Learner Cradle to Grave data service is a longer term goal, which will build on the employability data service, as well as on evolving national standards such as the Higher Education Achievement Record (HEAR), the Personal Learner Record (PLR), the Enterprise Passport and the Unique Learner Number (ULN). The purpose of the Student Mapping project is to inform the two projects above in the medium term, by providing use cases and student profiles , identifying the common problem and opportunity areas, for which project 2 in particular will develop solutions. We will work with those institutions undertaking major student experience and student systems reviews; we have already been talking to a number of these. Meanwhile we will gather evidence, perspectives and intelligence to form a consensus on what future, next generation student information management might look like. Our aim is to help you resolve current pains and requirements now, whilst keeping our eyes on the future. What, for example, would an end-to-end student relationship management service look like? In short, we hope to get you through the MOTs, while together we can all build a shared picture of what the next model (think driverless car) will look like. In addition to our core and extended group of stakeholders, we are already talking to a number of key partners with an interest in these areas, in particular the HEDIIP team, those involved in the HEAR, and international partners that provide and manage student information systems across a large numbers of institutions. We are in the process of forming an Advisory Group, comprised of key stakeholder representatives, to provide governance over the work, and we are currently forming the project plans and project teams that will take each project area forward. Shri Footring, shri.footring@jisc.ac.uk or Ruth Drysdale, ruth.drysdale@jisc.ac.uk (project managers). Finally, though P2A is dealing primarily with the transactional (information management and exchange) dimension of the student lifecycle rather than the transformational (learning) dimension, improving the student experience remains the ultimate objective. Accordingly, we have completed the first of several HE and FE student consultations we plan to undertake, which builds on Jisc’s extensive work to date in the digital student experience. Student Hubs undertook 100 interviews for us of a diverse range of HE students, asking about our plans for P2A, and the results are illuminating. These will be highlighted in the next P2A post! Posted by Simon Whittemore on February 23, 2015 in Uncategorized. It’s never too late to learn from the past when co-designing the future…. We recently commissioned a study on the The Management and Administrative Computing (MAC) Initiative in order to inform our Digital Futures activities, especially those, like From Prospect to Alumnus, in the area of Enterprise computing and corporate information management. The MAC Report, by Tim Philips, former Director of IT at the University of Bristol, is now available, and it synthesises the lessons learnt from the MAC initiative and highlights the implications for current and future collaborative activities, including From Prospect to Alumnus. 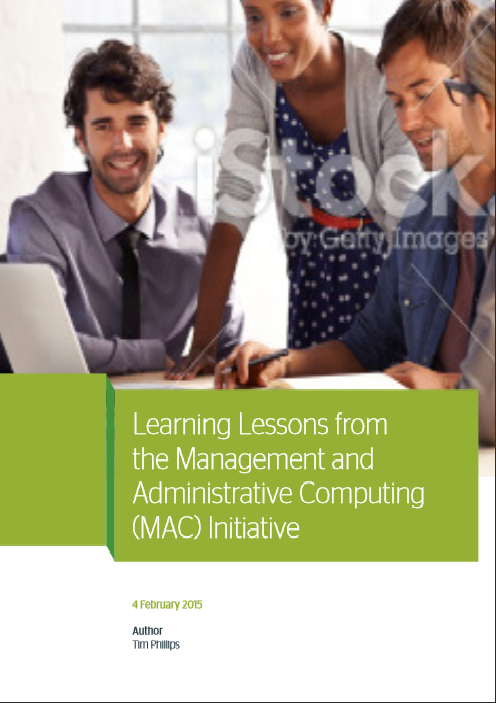 The MAC initiative, started by the University Grants Committee in 1988, ran until 1995 and set out to promote the development of a new generation of corporate information systems for UK universities in the late 1980s and early 1990s. As a formal change programme, it was not generally regarded as a success, however as the Report makes clear, there are some benefits that emerged from it. Phil Richards, Jisc’s Chief Innovation Officer, welcomed the Report: “As a neutral broker and service provider, committed to delivering shared services and digital solutions which benefit our customers and stakeholders, Jisc is keen to learn from past interventions such as the MAC initiative. There are also useful findings for other related initiatives like the Higher Education Data and Information Improvement Programme (HEDIIP). • MAC suffered from inadequate governance structures, an insufficiently strong business case, lack of focus on business process change and strategic alignment, and inadequate programme and project management. Target business benefits were also not adequately identified. • MAC was progressive in enabling more professional business systems management and collaboration between institutions. Some elements are still in use today. • The role of Jisc in enabling effective collaboration for innovation in digital services in information management is self-evident. Posted by Simon Whittemore on February 20, 2015 in Uncategorized. Each challenge is actively working to consult the sector to help inform where Jisc should focus its effort. In this post we’d like to share with you some of the feedback we’ve had so far from two consultation workshops (one in Newcastle and one in Glasgow) focusing on “From prospect to alumnus”. The two workshops were participatory in their nature to try and get as much input as we possibly could from each attendee. We used a mixture of individual activities so that everyone had the chance to participate, but also wider group discussions which helped to tease out some of the cross-cutting themes. Student lifecycle. We asked each participant to highlight their experience in relation to the student lifecycle. Where do individuals or their institution experience highs (things that work well for them) and lows (issues/barriers/road blocks). Individual case studies. Using one of the issues from the “student lifecycle” activity, we asked each participant to write an individual case study pertinent to them. 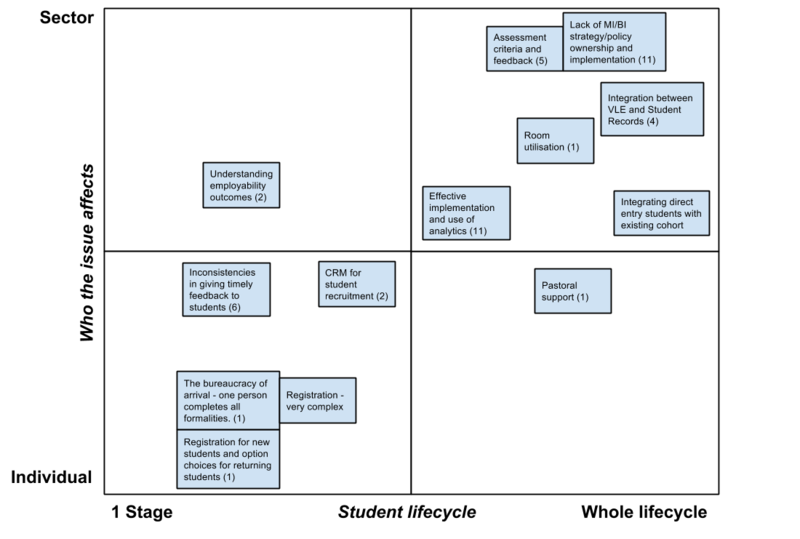 These were then mapped onto a matrix–one axis focusing on who the issue affected (individuals, departments, institutions, through to the wider sector and beyond) whilst the other axis focused on how many of the student lifecycle stages the issue affected. Solutions. Participants were then asked to vote on what they thought were the most pressing issues that Jisc needed to focus on. The top issues were selected and attendees were then given time to consider how these issues could be resolved. Invites for the workshops went out through a range of communication channels including, but not exclusive to: NUS, UCISA Corporate Information Systems Group (CISG), Relationship Management in HE/FE, funding agencies, and NCUB. There have been a number of reports focusing on the student lifecycle and different interpretations of what it does and does not include. We used the Jisc “Landscape Study of Student Lifecycle Relationship Management” as a foundation for discussions during our consultation, see Figure 1. Each participant was asked to annotate the model, highlighting lows and highs experienced along the journey. Figure 1, student lifecycle stages used during this consultation. A number of issues, similar to our previous workshops, were highlighted. Particularly around: staff skills/competencies; having a more joined-up approach, both systems and processes; and influencing vendors to address sector requirements. Areas where institutions noted particularly good experiences focused on the automation of administrative tasks, allowing staff to focus on more value-added activities. So for example, self-service student portals, online applications and registration. Delegates did note a word of warning here in terms of the quality of data eroding where students did not understand questions being asked of them. Delegates also noted that they have a lot of data available across the institution. The difficulty is using that data to best effect—a comment that also came up in our Birmingham workshop. This was an area where delegates felt there was a real skills shortage across the sector, in terms of being able to interpret and visualise the data. One key issue, brought up in both the Newcastle and Glasgow workshops was data retention. How long can various datasets be retained, when can we delete it, who is responsible for it. All questions that a good business classification scheme and records retention schedule can help to answer, however, with a new focus on learner analytics and “big data” it might be useful to revisit guidance in this area. Customer Relationship Management (CRM) was highlighted as another key topic. The Newcastle workshop focused on the use of CRM for managing enquiries pre-application and ensuring that data was correctly stored and joined-up to application/registration stage queries, the main issue being that there is no student record pre-application. The Glasgow workshop raised questions about the multiple instances of CRM use within an institution, in particular Alumni Vs Marketing. This evolved into a much wider debate about whether CRM actually worth the effort. Timetabling was another area many institutions are still struggling, particularly in terms of linking it to data available from other systems. 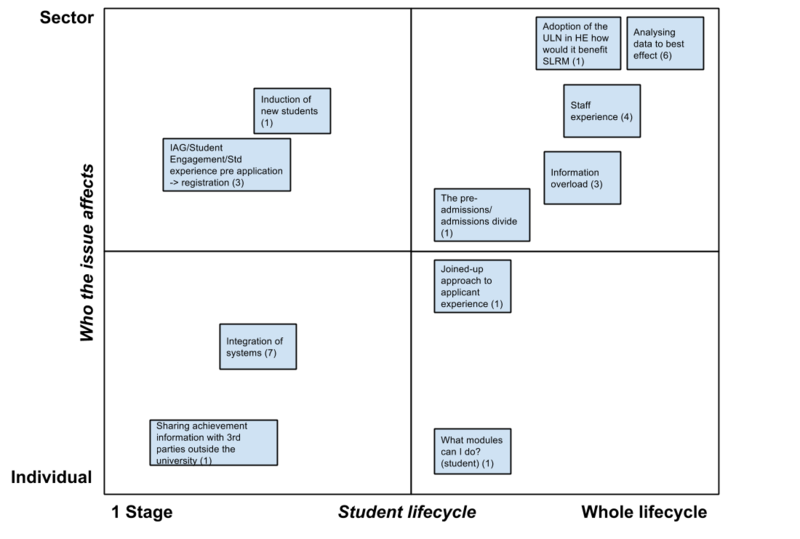 The Glasgow workshop actually raised it as a major piece missing from our student lifecycle diagram (Figure 1) citing it as one of, if not the, major issue affecting student experience. This relates to timetabling of lectures, room utilisation, and also assessment and feedback i.e. deadlines. There are discrete processes at every stage of the student lifecycle supported at various points depending on what faculty or service you’re in – this results in fragmentations in the process and supporting systems often do not talk to each other. Processes are designed to meet the needs of the university rather than the needs of the student. It is a multi-stakeholder issue with multiple agendas which don’t always complement each other. Institutions are a big ship to shift – it is difficult to change course on such a big issue. It’s also not just about technology – student needs and processes are also important. 5 votes – Student portal and joined up data. Do we want a student portal? What should it look like? Should it be seamless and look the same at every stage of student journey and for every student in every circumstance? OR does interaction of students vary over time? Do we even want a portal in the first place? Either way we need to join up the data behind the scenes – we have disparate systems and a myriad of issues. Postgraduate research students can start at any time of year, and can progress to the next stage of their studies at any time. Systems that support students are set to the academic year. Increasingly more and more taught students as break the traditional timescales i.e. programmes starting in January but student management systems are based on September to July. Staff often need to break the rules to fit the IT, with potential legal issues (i.e. Home Office if international students finish their studies in January but the board isn’t until July). Diversification of programmes and partnerships/collaboration also an issue as they are creating more non-standard students. We are starting to need increasingly imaginative ways to record students to give access to systems, but avoiding double reporting to HEFCE. 8 votes – too many disjointed systems which capture student data but do not speak to each other. Because of multiple systems and data capturing tools we are reliant on staff having a certain level of IT skills. Some people who have been in an institution a long time do not have these skills and we’re not doing enough to upskill people. Should we be upskilling people to be able to access data, or should we be making accessing data simpler? 6 votes – Everyone tells me the university needs a CRM system. 6 votes- student induction and re-induction – make it meaningful. We need to get students off on the right footing, and give them best foundation for the rest of their career. This begins before they arrive. We need to look at induction from a student focused perspective rather than what managers need. A big issue exists with user IDs and passwords – by the time students become students they have different accounts in over 3 or 4 University systems. Students end up with different passwords on enquiry, application and to get into student portal, notified by a different welcome system with a different password. We need to manage their identity as they go through the lifecycle but we make it complex for students. Process review and improvement is vital if the sector is to come close to implementing a lifecycle-wide CRM system although there are doubts as to whether CRM is the answer. Non-standard programmes are becoming the norm which existing systems struggle to cope with. Focus needs to be on the student as opposed to modules and programmes. Student portal allowing students to manage their own data, but ensuring it links to other systems available across the organisation ensuring a seamless service. More effective data governance to prevent a silo-mentality. Systems are bought to suit a specific department’s business case. It must adhere and join up with the organisation’s wider strategic aims. Identity management emerged as a key theme—one username and one person to access organisational services. Final feedback–what stood out? What should Jisc take forward? We’re all facing similar issues but are trying to tackle the issues in different ways. The sector can learn from each other and share good practice as we attempt to address the P2A challenge. It can be difficult to engage people within the institution so it’s good to be involved in a pan sector discussion. Getting the tech industry that supports HE to think in a more flexible way. Jisc could help HEIs get want they want from the providers of systems. The more we can influence those who provide systems the better for institutions. A collective view from Jisc could help influence sector wide discussions with providers. Addressing this challenge is important – Jisc are onto something here. Everyone is looking at a more flexible future – Jisc needs to address this at a national level. The issue is complex with lots of different stakeholders and it won’t be easy to tackle. The fact we all have the same issues highlights that the students are suffering. The challenge is also enormous! Knowing what size is best to be trying to address the problem is difficult – by trying to do it all could achieve nothing. Too small and it could be too focussed – we need a balance. Because of its complexity, what would be useful would be a set of principles which institutions can be thinking about when deciding what approaches should be taken. Realising that the systems have been built around the needs of the university, not the students. Silos exist – both departmental and systems. We need to think about how we encourage people not to work in these silos and break down barriers. It’s a common problem across the sector. This post was co-authored by Marc Dobson and Andrew Stewart. Posted by Marc Dobson on August 19, 2014 in Uncategorized and tagged competencies, consultation, CRM, data, feedback, infrastructure, integration, joined-up, silos, staff skills, student lifecycle. Each challenge is actively working to consult the sector to help inform where Jisc should focus its effort. In this post we’d like to share with you some of the feedback we’ve had so far from two consultation workshops (one in London and one in Birmingham) focusing on “From prospect to alumnus”. Individual stages. Experience varied when focusing on a particular stage of the lifecycle. One institution might have cracked it at the application stage whilst others are floundering. Institutions that are struggling in one particular stage would find it helpful to know who in the sector is mature in that area and how they achieved that maturity. They would also find it useful to know what already exists in terms of information, advice and guidance in relation to a specific stage. A lot of the issues being highlighted at individual stages are areas that Jisc have been/or is involved with e.g. assessment and feedback, timetabling, and learner analytics. The links provided are just examples of what’s available from Jisc and so perhaps there is further work to be done in improving access to those resources and communicating the learning from some of those areas. Digital data we collect on students on multiple systems. How can the data be brought together to enhance student experience, increase retention, and support students. There are complexities in providing data to staff, giving students access and moving data across multiple systems. It is noticeable that there is a lack of governance of management information and business intelligence. Departments tend to look after their own interests, and nobody takes responsibility for MI and BI across the board. There are also issues with data retention, meaning it is difficult to work out what to retain, maintain or archive. Data governance can be difficult without a lack of strategy and vision from the top – it is hard to get buy in at VC level. Feedback is a big issue across the board. It is both a human problem (people can slow things down) and a system problem – fi systems are not user friendly some people will not bother to use them, meaning feedback can be delayed or not given at all. This could be an issue for retention in some institutions. There is a mix of institutions using in-house systems and established solutions. This is a sector based issue which affects the whole lifecycle. Criteria are often not very objective – students don’t know what they need to do to get a 2:1 for example. There are also inconsistencies in feedback which has implications for pastoral support. 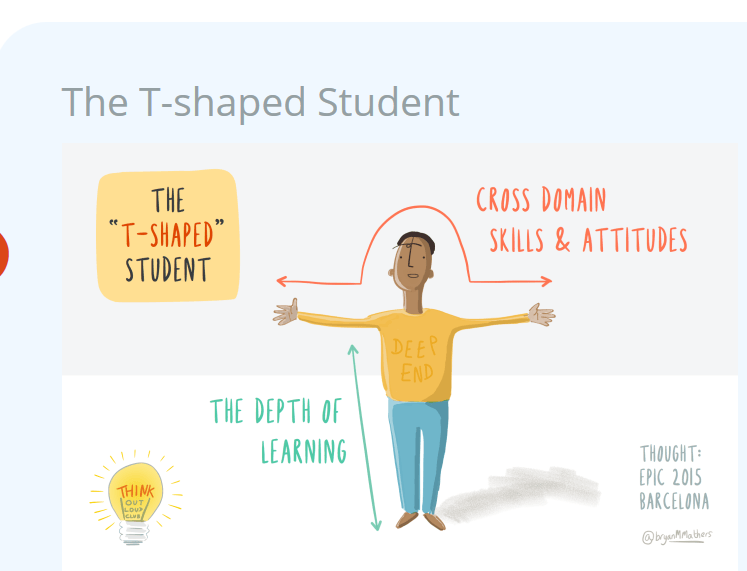 Students don’t know what to aim for which in turn can affect their outcomes, and can have a knock on effect for other aspects of student experience. From an institutional perspective the greatest issues are around registration, induction, learning and teaching and assessment but goes wider. MIS doesn’t talk well to the VLE impacting on the student and lecturer experience (for example when data hasn’t rolled onto the VLE at the start of the course, and students not being recognised by systems). Similar issues exist with assessment and student records – systems can be clunky, require unnecessary effort, and delays in feedback can occur. Systems can constrain rather than support what can be done due to lack of integration between assessment and student record systems. A lot of the technical implementations we have were put there to do specific things, perhaps a long time ago. We are now trying to get them to do things they weren’t designed for, bolting on rather than doing it from the start. People are experiencing the same problems, but trying to work around it in different ways. Masses of data exists but nobody knows how to use it or understood reports. We need to present data fit for purpose, for different audiences, that can be created automatically and be sustainable. A people focused solution needs to be there before technological implementation. People have limited time to engage with receiving data so we have to use it to best effect. There is a small window of opportunity – people respond best to data when presented in different ways, for example people with a bad experience of numbers may prefer visualisation to get the key message straight away. Technology needs to be lean, mean and efficient, with a strategic push to present data that means things to people, in digestible quantities. Automation of as much data as possible is important, communicated at regular times (through automation). There needs to be a big emphasis on usability. Recognition of learning and teaching is vital, but is low – without it staff will not put in as much effort. There has also been a culture which has developed whereby the student is at the heart of everything, but staff experience directly impacts on student experience but this is often not thought through. You can do as much as possible with learning and teaching (L&T) systems and processes to free up time for academics, but will they spend that time on L&T or on research which will not benefit student experience but often results in greater recognition and reward in institutions. Staff need to understand the usefulness and benefits of using systems, otherwise systems will not benefit students. There are variations of who is using and populating systems with data – sometimes academic staff, sometimes administrators. This can vary across institutions, and also departments within institutions. Standardisation in the use of systems is an immense challenge and could remove some of the necessary flexibility required. Analytics needs to be planned, we need to work out common issues and problems. Analytics also needs to be complemented by qualitative data. There needs to be different ways and styles of viewing data so that it is understandable to all and allows everyone to engage with it. Feedback needs to be timely. Standards would help to provide acceptable standards. Sector specific practices should be taken into account to harmonise feedback. Feedback should be acted upon, and student view on it monitored. Pastoral care relies on systems, which links into feedback above. Need for a consistent approach in developing systems. Integration of systems moving away from silo approach – needs strategy, definitions, processes, standardised processes, prototyping and piloting. Staff experience is key – staff need to be recognised for their efforts with students, staff are key to enhancing student experience. Voice of the sector. Jisc could act as a voice of the sector to suppliers to establish common requirements and a common integration process. Systems Integration. Some systems work well together, others don’t. There is a need to integrate systems to give a complete view of the lifecycle. We therefore need to work out how systems can work well together, addressing issues of multiple systems and each part of the lifecycle and overlapping systems. Analytics. This is still an issue, even though it has already been looked at by Jisc. Outputs from other programmes should inform the “From prospect to alumnus” theme. Human elements. Not all of the problems are systems related, people and cultural issues need to be addressed. 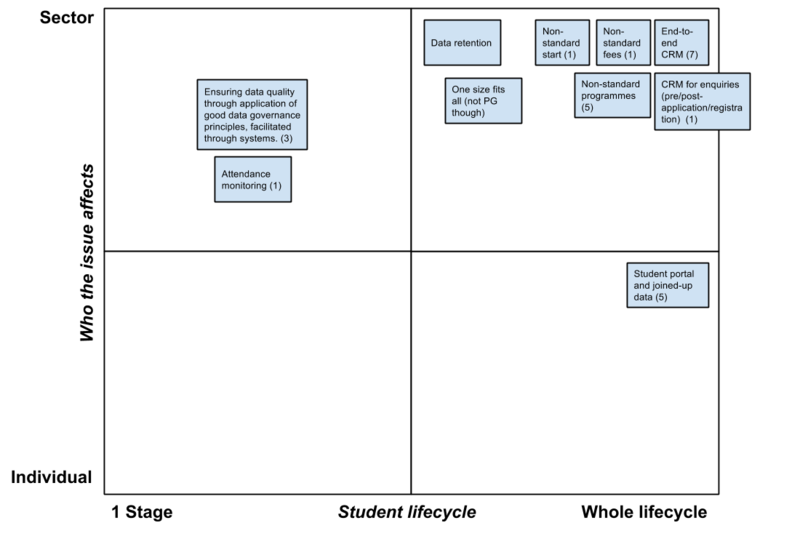 Jisc could provide a framework for good practice and a self-assessment tool to work out where improvements can be made. There is a need to get the perspective of staff and students before deciding how to integrate systems–staff need to feel that technology is an enabler rather than a barrier, and that people have the appropriate skills. Consultation. Jisc should find out more about what students think, just like staff we need to talk to them and manage expectations. Don’t overlook the start. Jisc should make sure the applicant side of the student experience is given attention. Sharing best practice. Systems integration is not a new thing–could Jisc learn by speaking to sectors outside of education? A great deal of commonality has been identified of the problems faced, not just about digital aspects but the whole student experience. Posted by Andrew Stewart on August 8, 2014 in Consultation workshop and tagged analytics, assessment, business intelligence, competencies, consultation, feedback, infrastructure, integration, joined-up, staff experience, staff skills, student lifecycle. You can still contribute to the consultation! | From Prospect to Alumnus on Why this challenge? From prospect to alumnus – you can still contribute to the consultation. 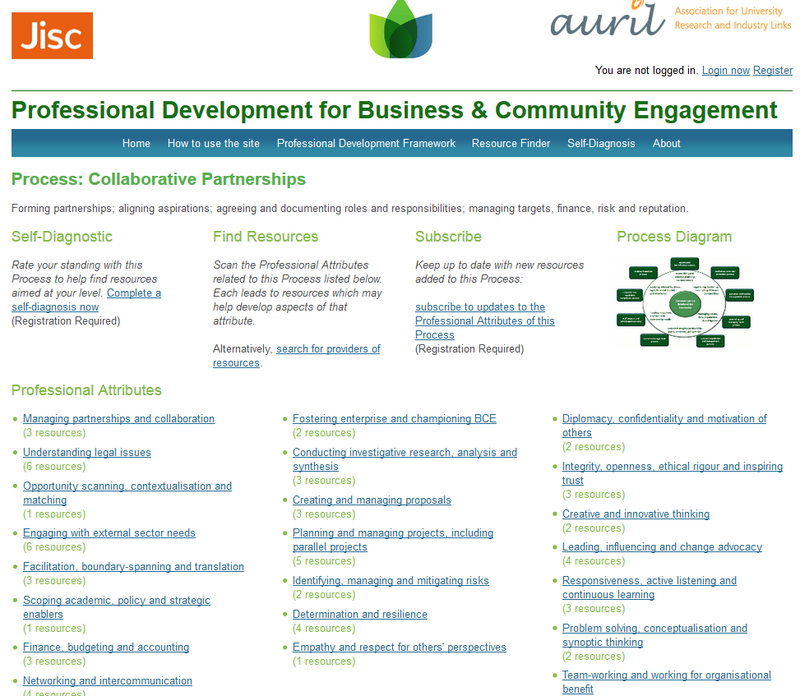 | Jisc Business & Community Engagement (BCE) on Why this challenge?